Mental Health First Aid – February 20 and 21, Register Now! Concordia University of Edmonton is a caring campus community that prioritizes support, collaboration, and work-life balance for optimizing mental health and wellbeing. 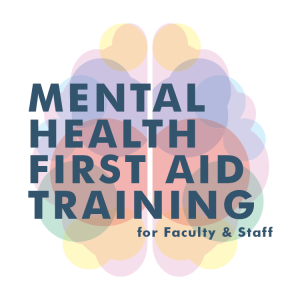 Winter 2019 Mental Health First Aid (MHFA) Training dates are now open for registration for all interested faculty and staff. The instructor is Georgette Reed, a former Olympian, and the Health and Wellness Coordinator with Edmonton Fire Services. One person in five will experience a mental health problem this year. Evidence shows that MHFA course participants increase their awareness of signs and symptoms of the most common mental health problems. The most difficult part of intervening is knowing what to say. Evidence shows that taking an MHFA course increases the confidence participants have in engaging someone experiencing a mental health problem or crisis. MHFA Basic is intended for adults interacting with adults (18 years and older). This courses focuses on the four most common mental health disorders including substance related, mood related, anxiety and trauma related, and psychotic disorders. Participants who take this course are well prepared to interact confidently about mental health with their family, friends, communities, and workplaces. This is available free-of-charge to all Concordia staff and faculty. The winter 2019 course is February 20 and 21, 2019, each day is from 9:00 AM – 4:00 PM.